I remember the video game coming out more than I remember the movie being released, the story of Flushed Away lending itself to that sort of action, task-completion, and age group. It’s a fast-paced plot, never a dull moment concocted, and there are a hundred small characters to throw into 80 minutes. Toss in a hundred shots to the crotch and you’ve got yourself a movie that kids will love, especially, 10-year-old boys, and a franchise that can actually sell quite nicely, if not exactly compete with the big dogs like Pixar. 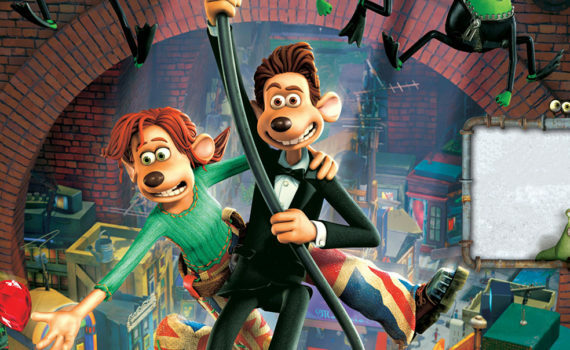 Flushed Away is a fun comedy/adventure for younger audiences, but it is also just smart enough not to turn adults completely away, making it a surprising hit from 10 years ago that holds up quite nicely today. Roddy is a pampered rat, living in Kensington, London with a rich family, having the run of the place when they’re off on vacation. He doesn’t know either the dangers of the outside world or the friendship of a rowdy group, but his lonely little life is safe, and that’s all that he thinks he wants. When an unwanted house guest pops in, Roddy is flushed down the loo into the sewers, where he is much more than out of place. His luck’s no good either, as he runs into a rat named Rita who is being chased by an evil toad called …wait for it …The Toad. The loony mastermind wants a ruby Rita possesses, but he also has a greater and more sinister plan, one that will destroy ratkind once and for all. There are positives and there are negatives, but you can’t expect much else from a children’s movie about the hijinks of rats, even one that does slightly appeal to adults as well. The movie starts off well enough, with an ultra-British Wallace and Gromit feel, some cool references, and a load of catchy tunes. That the action goes slightly silly slightly soon doesn’t exactly kill the mood for grownups, but it does leave us a little behind. When characters start getting banged between the legs repeatedly for laughs, that’s when I start to question whether the movie was made for me. Ultimately, it isn’t, it’s for a younger audience, and boy will they enjoy it. The goofy humor, the singing slugs, the agile frogs, all the high-intensity boat scenes; it’s a barrel of fun. Lower your expectations, connect with your inner child, or watch Flushed Away with your kids; there is definitely a lot you can enjoy if you allow yourself to, even if the content isn’t exactly classy.